One of the biggest benefits of owning your own business is the ability to watch it grow. The only issue is that as your company begins to expand, space can quickly become an issue. 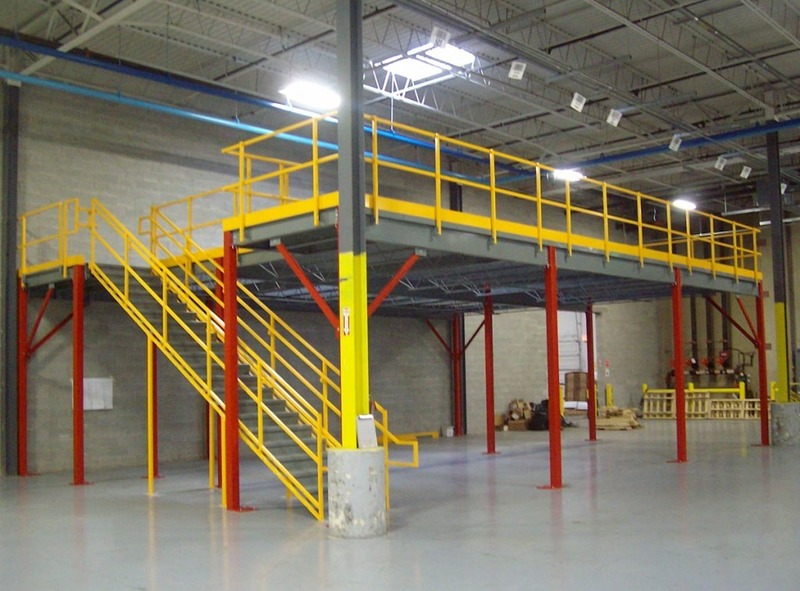 Whether you are a factory owner looking to improve safety or need to add some corporate offices above your existing workspace, cold-rolled mezzanines are the solution you are looking for. Both standard and free standing mezzanines are gaining popularity in the business world because they help companies take full advantage of their vertical space. They are easy to move and can be very inexpensive to create. By adding them to your workspace, you are cutting down on your real estate expansion, saving your business time and money. Learn more about why steel mezzanines are an important part of the modern business and how they can help your company grow. Having a layout that helps you to effectively run your business is important. Your layout can make it easier to work or access certain features. For example, if you wanted to reduce walk time to the break room, you may want to consider moving your office into the mezzanine and converting the old space into a closer break room. This small step could allow you to get a few more minutes of work in per day, which adds up over time. Cheap Panel Built mezzanines online help to make these adjustments much easier. Mezzanines, much like modular buildings, can be easily moved or adjusted as your business needs change. This gives you the flexibility you need to make efficient adjustments. Cold-rolled mezzanines available online help to take your investment even further by offering a design that doesn’t require on-site construction. Instead, the mezzanines are built off-site by an experienced construction crew. Mezzanines by Panel Built are always made by skilled individuals in an assembly line fashion, which helps to speed up the manufacturing process. You won’t have to worry about not having your mezzanine system for very long, which helps you get back to work as quickly as possible. There are several benefits to working with the best manufacturer available for mezzanines. The best modular mezzanines available for sale will have full customization options that help you get exactly what you want out of the space. Whether you want an attractive office mezzanine or a simple catwalk to help you oversee employee activity, it can be included in your custom design. There are several different features that can be included in your mezzanine structure. It doesn’t matter if you are adding one floor or five, the benefits will remain the same. An experienced company that sells prefabricated steel mezzanines will also offer a wide variety of HVAC features to help you feel more comfortable while you work. This can be incredibly helpful if you are planning on spending extended periods of time in your prefabricated mezzanines. How Soon Can I Get Prefabricated Steel Mezzanines? Prefabricated steel mezzanines, even ones that feature a custom design, can be built at a much faster rate than a traditional building. In fact, many companies use structural mezzanines as temporary systems, yet leave them in place when they discover how functional they actually are. Panel Built has worked with many companies to create mezzanines as quickly as possible to reduce your overall wait time. Mezzanine offices offer a wide range of options available, yet the increase in construction time is usually minimal. This is due to the company’s expert building crew that pays close attention to every detail. They understand the most efficient ways to work and can get the job done right in as little as three days. Much like a prefabricated building, the mezzanine is completed and shipped in large pieces. It is then quickly assembled at your location. The ultimate goal is to reduce the time it takes to get the new system in place, but also reduce the time it takes in the future to move the mezzanine. If your business needs change, you don’t want to have to take a few days to assemble and reassemble your building! Large mezzanines can be moved in very little time, giving you a practical investment that can be used again and again. There are several companies that sell steel mezzanines online, but none stand out quite as much as Panel Built. Panel Built has years of experience creating beautiful mezzanines that you can be proud to place in your building. The company has high standards and is always looking for ways to improve the structural integrity of their mezzanines so they last even longer. Affordability plays a huge role in how the modern company makes decisions. Mezzanines are a practical solution to your space issues that can be used even as your needs change. This makes it a great investment for a growing company. If you are wondering where to find custom mezzanines online and how to save money on some of the most innovative designs, contact Panel Built today. Your business deserves the best mezzanines available. Visit the Panel Built website today to see examples of practical mezzanine designs and get a great idea of what’s available.